In 2007 William Parker conceived a DVD as a collaboration between William, Lois Eby and David Budbill. The DVD, now available in SD DVD or HD Download, features Lois’ ink drawings which she created for the original publications of David Budbill’s Judevine poems. These drawings, in motion through the efforts of the videographer Danny Weiss, are accompanied by four New York musicians plus improvised alto saxophone by Daniel Carter, playing an original score for string quartet by William Parker. 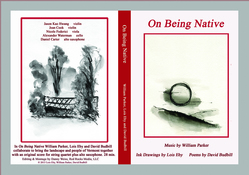 The DVD includes David reading his poem "On Being Native" and several other poems and William Parker playing solo bass behind some of the poems.